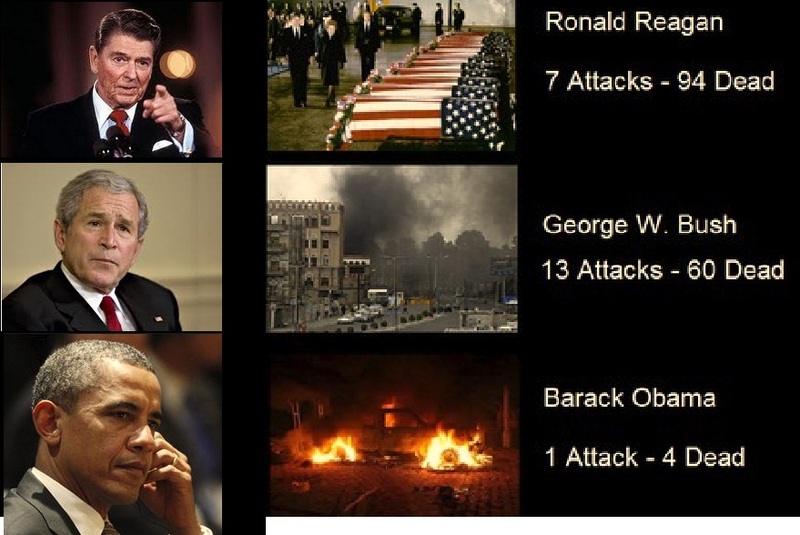 Benghazi in perspective: Reagan 7 attacks 94 Dead; Bush 13 attacks 60 Dead; Obama 1 attack 4 Dead! Going on two years the Republicans and their followers having been beating Benghazi like a Mexican Piñata and it is beyond any doubt that they are fully cognizant of the record of Ronald Reagan, George W. Bush and President Obama. In the case of Reagan he sent hundreds of Marines to Lebanon with orders not to keep their Rifles loaded. A lunatic with a pick-up-truck loaded with explosives, rammed the gates and in a single incident killed more than 243 Marines. Reagan subsequently brought the remainder of the Marines home. And we must never ever forget that thoughtless Bush invaded Iraq and we lost thousands of Soldiers; tens of thousands were severely injured and more than seventy five thousand are left with mental problems. 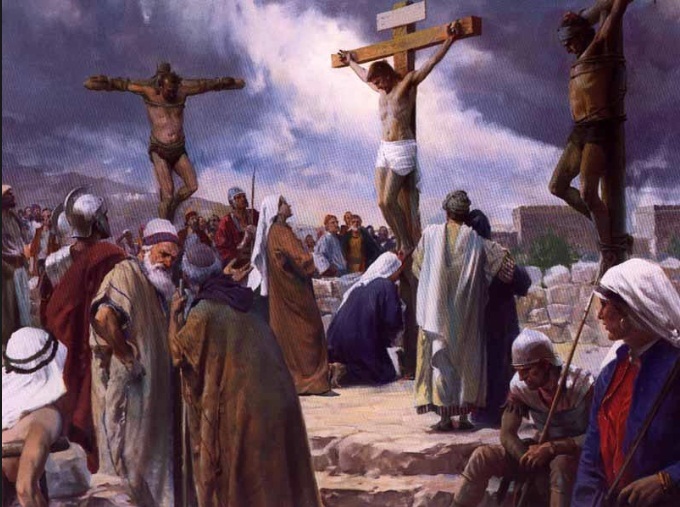 What was our gain? All we did was replace a Sunni Dictator with a Shiite Dictator who cast his lot with Iran. The cost to the American Tax Payers stands at 1.7 Trillion Dollars. On Twitter, the washed-up actor James Woods embellishes in wanting Justice for Benghazi. Just what does James Woods know about anything having to do with foreign Policy? Even George W. Bush in 2008 knew his limitations and that was self evident when Putin invaded a section of Georgia and former President George W. Bush left it alone. As far as the Ukraine situation Sanctions are really the only viable options at this time and thus far, the United States and the European Union have placed Sanctions on Russia and as of this morning President Obama announced further Sanctions. People are wondering why Obama doesn’t target Vladimir Putin directly and the reason I believe is that Obama is smart enough to know that closing all the doors on Putin with no exit at this time, could very well escalate this manageable crisis into something much larger. In addition, Europe is our biggest trading Partners and Obama must remain mindful of that fact. Like the crazy idiot in Nevada, Cliven Bundy, Republicans are all Hat and no Cattle, or another way to put it; they are all mouth and no brains! 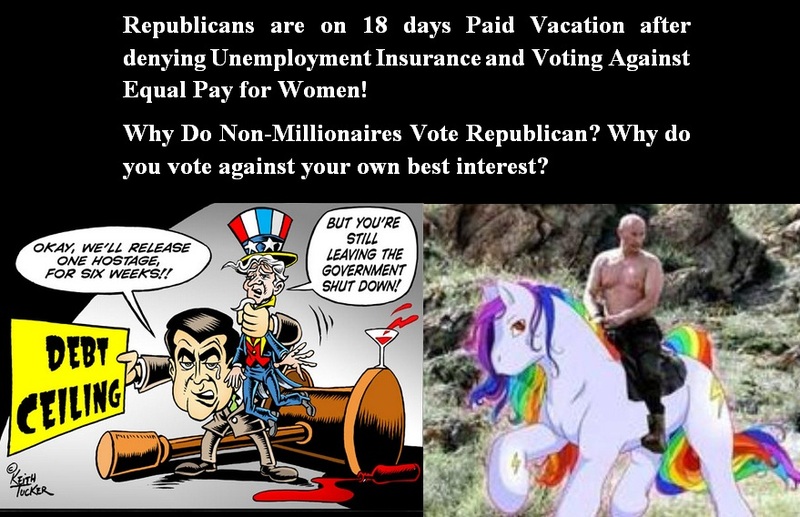 Republicans on 18 days paid vacation after denying Unemployment Insurance and blocking equal pay for women! The Nexus of Republicans and Vladimir Putin! Banks are no longer collapsing; The Stock Market is at an all time high; The S & P went from a low of 730 and stands presently over 1,800, that helped the 401K Plans to not only regain 100% of its value, but added value beyond that. Unemployment that was at an all time high over 10% when Bush left Office is today 6.7%. Under Bush we had a net gain of jobs of one million for all of Bush’s eight years and under Obama, we added 8.9 million new jobs. Obama ended the Iraq war and by the end of this year we would be out of Afghanistan. The total cost of those two wars thus far, is estimated to be over four (4) trillion dollars. However, Republicans cannot take credit for anything because rather than help they obstructed, lied, cheated, schemed and did everything to persuade the American people that “all that ails America and their lives is the fault of President Obama.” As strange as it may seem, a great majority of Americans seems to agree with the Republicans misnomer. To be frank about how uninformed and ignorant we have become, only 27% of Americans knew where Ukraine is located. In a recent Poll many Americans thought that Ukraine was within one of our fifty States; some thought it was located in South America and others placed Ukraine literally in the Ocean 180 degrees from where it is. So, in the final analysis, some of us are just plain dumb! Putin is using Ukraine as a Panacea to hide Russia’s rough and tumbled economy and it is getting worse for Russia by the day as it pertains to Russia’s financial stability. However, Russia like North Korea control the media and Putin spoon feed the Russian people as to how great Russia is doing and out of being uninformed and ignorant of facts, many Russians see Putin as their Savior the same as many Americans see the Republicans as theirs. Nothing can be further from the truth because factually, Republican Legislators have become Pariahs of the Middle-Class and the Poor and Putin; he is a self centered, conceited Pariah of anyone and everyone, except Putin. The Republicans are all mouth and no brain! 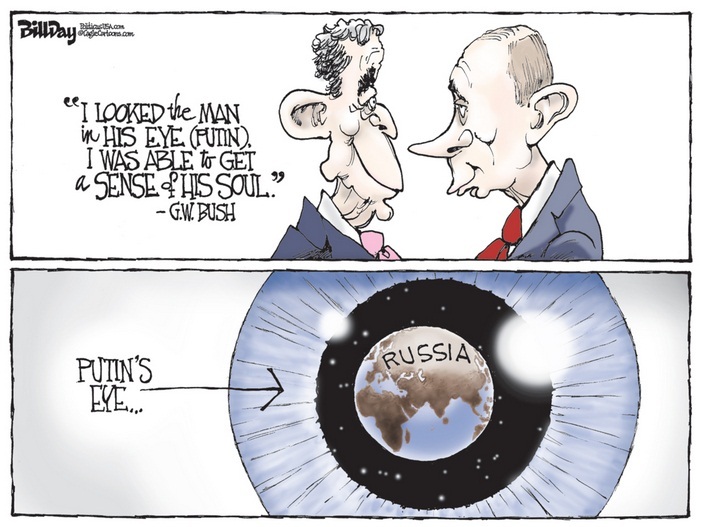 For Republicans to be whining about President Obama misreading Putin, they should reflect on their own guy, The Great George W. Bush who saw Putin’s Soul! I think the truth of the matter is the past Presidents that have dealt with Putin and Obama who is now dealing with Putin; they can’t be faulted for what they saw in Chameleon Putin! Putin seems a little deranged and also possibly enraged over the collapse of the USSR. On top of that the information Edward Snowden stole and gave to Putin has America’s Defense Plan in the unlikely event of war. Putin who must have examined what Snowden gave him then realized that he “badly needed” a buffer zone and hence the reason he annexed Crimea, however, Russia’s entry into Crimea is “only” by air or Sea. On the Eastern Part of Ukraine, Russia “land” borders with Ukraine and that may be Putin’s next goal. The right wing who seems always hell bent on war can criticize Obama all they want, but, war seems like the most unlikely option. Economic Sanctions on the other hand, especially “targeting” Russia’s Central Bank would collapse Russia’s already devastated economy. But, even so, Obama has to be mindful of our European Allies. The Republicans are all mouth and no brain! Why are Republicans so offended by Liberals accomplishments? Liberals got women the right to vote! Liberals got African-Americans the right to vote! Liberals created Social Security and lifted millions of elderly out of Poverty. Liberals ended Segregation. Liberals passed the Civil Right Act; The Voting Right Act; Liberals created Medicare and Medicaid and passed the Clean Air Act and the Clean Water Act. Republicans Voted against all of the above and have continued to this day to abolish the Programs or gut the Programs by cutting funding for which they have done and will continue to do. 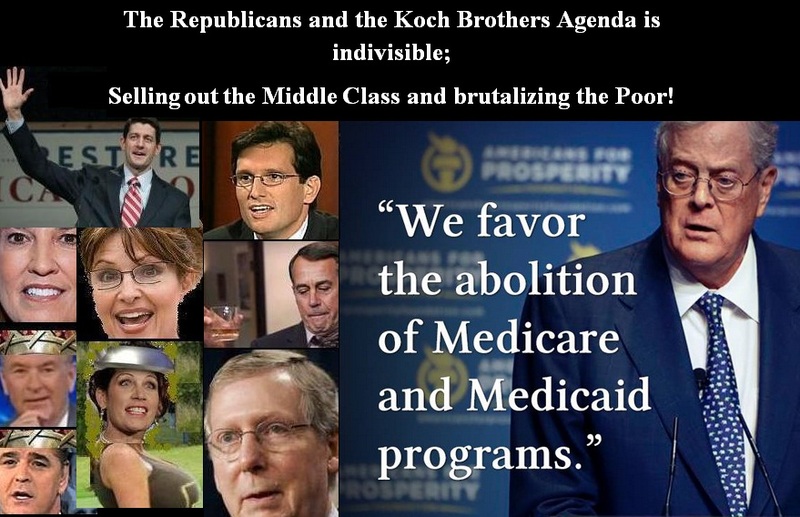 Republican Supporters that are not Millionaires or Billionaires! Republican Run Red States are some of the Poorest in the Nation; 45% of Children depend on Food Stamps; the Unemployment Insurance that expired December 2013 that the Republicans have refused to pass the extension Bill, hundreds of thousands of active and returning Veterans and the people that still can’t find work due to the unbelievable collapse of our Economy on George W. Bush’s Stewardship, are without the Unemployment Insurance and most of them are completely without any money to take care of their children. Hence, it begs the question that whether you are Republican, Independent or Democrat and you if are not in the Millionaires or Billionaires Club, why do you support the GOP with your vote that enhances misery on you and your children? Are you so blinded by being brainwashed or ignorance that you are unable to face reality? Or is it some other prejudice that possesses you body, soul and mind that causes you to suffer for the Republican Politicians that have and continues to protect only the very rich? The Republicans just passed a Budget in the House of Representatives solely on GOP Party line that increases the Middle Class Taxes by $2,000.00, but, gives an additional $87,000.00 to the Rich. Just when you are going to face reality that your Greek god, Ronald Reagan idea of “trickled-down-economics is a farce that have scammed you and continue to scam you of having a better life for you and your children!